This article will teach you how to add, delete, set IP restrictions, and set permissions for users for your 3dcart Administration panel. You are able to add additional users to your Online Store Manager, as well as set specific access permissions for each individual. You can also change passwords for the users anytime you need. 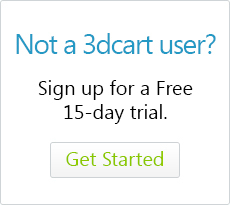 The number of administrator users that you can add to your store is dependent on the specific plan that you have with 3dcart. Please reivew the 3dcart Pricing Page for specifics. Enter the Username for the account - this must contain only letters, numbers and underscores. At least 1 letter, 1 number and at least 7 characters long. For each one of the administrator accounts you can specify which areas of the Administration Panel they will be allowed to go to. For example, you may have a login created for your Webmaster and you need to restrict them from accessing your customer's information. Alternately, you may want your sales staff personnel to have access to customers and orders, but not to design aspects of the site. has access only to the store's orders information. You may also grant or limit access to certain areas of the Online Store Manager as needed by using the various checkboxes located on the bottom half of the page. However, please be aware of one specific checkbox labeled "Administrator Access" which will grant full access - regardless of which checkboxes are marked or unmarked. For example, let's say you have a new user which is granted Full Admin Permissions. However you do not want them to have the ability to submit support tickets on your company's behalf from the Online Store Manager. For this situation, you would uncheck the "Administrator Access" and "Support Tickets" checkboxes and save your changes. The user will then be able to access all areas of the Online Store Manager as desired, but they will have the support ticket ability removed. To add your security questions, select a question from the available "Question 1" drop down, and use the text box immediately after it to provide the answer. Then, repeat these steps for all 3 security questions. In the next sections, we will discuss how to Delete users, Chenge User passwords when needed, and view the user's activity logs. Look to the far right of the user and click on the "Action ->Delete" button to remove them. Look to the far right of the user and click on the "Action ->Edit" button. On the user's page, look to the top right and click on "Reset Password"
A password reset link will be sent to the user's email address on file. when they recieve this email they will be asked to enter their new password. Please be sure that the new password contains at least 8 to 12 characters, at least one CAPITAL letter, at least one lowercase letter, at least one number and no special characters. The password for each account needs to be changed every 90 days; the system will prompt the user for this when logging in. The password needs to be different than the last 5 passwords used. If you have a Static IP with your current Internet Service Provider (ISP) then you can assign the IP Restriction to any of the accounts; this will only allow users from that IP address to login using the specific account credentials. Even with the correct username and password you won't be available to login from a different location. Remember that if your IP is dynamic then you cannot use this option, applying the IP restriction will lock you out of your account. You can also click on the "Click Here to fetch your current IP link. This will fetch your connection's IP for you and add it to the IP Restriction field.